A man plays guitar for patients at Sharp Memorial Hospital. 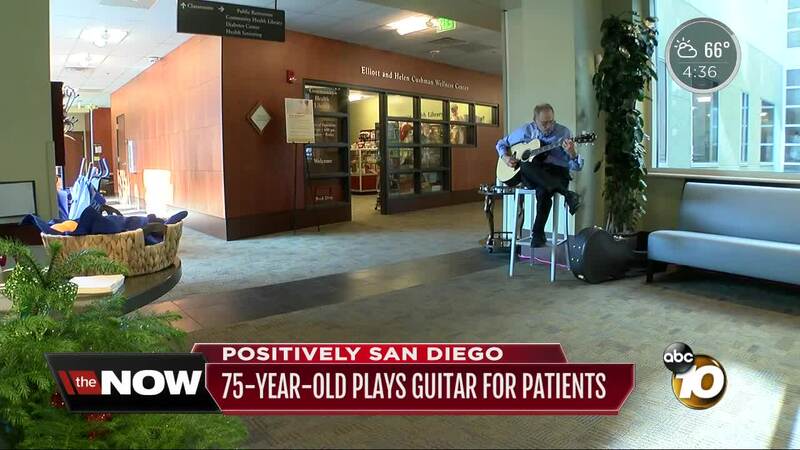 SAN DIEGO (KGTV) - A San Diego guitarist is bringing smiles and lifting spirits at Sharp Memorial Hospital. Mark Shatz performs for patients and anyone who walks by. Shatz learned how to play guitar when he was 12 years old. He performed with a few garage bands but stopped for 33 years. “Wouldn’t you know it, somebody handed me a guitar and said ‘would you play happy birthday’,” Shatz remembered. Shatz had the idea to play for patients when he was visiting his wife in the hospital. “My wife was happy, there was a friend visiting my wife that was happy, and the patient in the other bed…I couldn't believe the reaction of the patient in the other bed,” said Shatz. The woman was laughing and smiling when Shatz finished. “I’m gonna do it as long as I can,” he said.